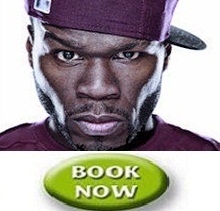 50 Cent is heading back to the UK next year and will be calling at the LG Arena on Friday 19 March. The controversial figure, fitty (50 Cent) will aim to keep his fans and critics on their toes this November when he releases his new album ‘Before I Self Destruct’ packaged together with a full length feature film by the same name. The New York rapper plays the lead in the film, which will be his directorial debut. The double CD/DVD ‘Before I Self Destruct’ is unleashed on 16 November through Shady/Aftermath/Interscope Records. This will also see 50 Cent, who has become one of the most successful rappers in the history of the genre, reunite with his original mentors Dr. Dre and Eminem for the first time since the release of his debut album ‘Get Rich Or Die Trying’. Darker and harder than his last two releases – 2005’s multi-platinum ‘The Massacre’ and 2007’s ‘Curtis’ - ‘Before I Self Destruct’ is a return to the roots and feel of 50 Cent’s 2003 debut, which went on to sell 12 million copies worldwide.